Please use this online form. As a relocated American, I really appreciate the expert advice that intertax-consult provides. After using their services for more than 3 years now I can honestly say that they make the complicated task of doing my taxes and dealing with the financeamt easy! I am very satisfied with their services and would recommend them to everyone! Intertax-Consult is the best tax consult that I know in Germany. Getting the pension is quite a process on the German Pension fund side and rather even more complex because I have already relocated to my home country. Martin and his team are very professional, they are prompt and do things in a quick, efficient and understanding way that helps you understand the whole process. As a foreigner in Germany that does not understand the laws and the language so well, Intertax was excellent. I am very impressed with their work. I recommend them fully, they are simply the best! – It feels old-school to send emails back and forth with attachments. In my case, I prepared a Dropbox folder with documents well named and filed. I shared that with the consultant and I hope I made their life a little easier. I would suggest that they somehow promote this kind of behaviour because it helps prevent chaos. Extremely good service. Update knowledge with empathy for personal circumstances. I used this service in three occasions and I am fully satisfied. Next year I will use it again. Everyone I have been in contact with have been polite and helpful. They answer emails promtly are knowledgable about tax returns between countries within Europe and have answered all questions clearly. Highly recommended. I am a US Citizen who relocated from the USA to Germany and back again in 3 years. These transitions required filing of tax returns to both the USA and Germany. Each year had its own unique complications. intertax-consult guided me each of these 3 years. They were very responsive, very quick, and very efficient. They were always very professional and courteous and proactively went the extra mile in new and complex situations. They networked seamlessly with the tax professional preparing my US returns. hey took very good care of me and I cannot speak highly enough of intertax-consult and I enthusiastically recommend them to anyone needing professional tax support. I had a preliminary call with Mr. Gundermann to assess my taxing situation which eventually turned out to be quite simple. He told me the potential savings were probably low and that it wouldn’t make sense in my situation to hire them as the savings would basically be transfered to him over the cost of the service. Even though this became evident early on the call, Mr. Gundermann remained on the line and answered all of my questions for over half an hour. His honesty and availability are greatly appreciated. Martin goes above and beyond providing me and my partner with an understanding of our current and potential future tax situation. He takes time to explain, and give the sense he cares about his customers and enjoys his work. I highly recommend him. Excellent service, kind, prompt response and available when needed. A very qualified group and always friendly. I appreciate the language possibilities and International experiences! 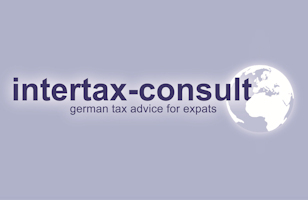 Intertax Consult is helping me with my tax issues in Gemany, since quite a few years. They provide excellent, very fast and accurate service. Mails are responded promptly and to the point. I only wish the German tax office would be so fast as well :-). Intertax Consult: Absolutely recommended. We welcome intertax-consult on our new evaluation website and wish you good evaluations from satisfied clients and success with this evaluation platform. Looking forward to be working together with you! ► I award 5 stars | ► Valuation in relation to: Tax return. ► I award 4 stars | ► Valuation in relation to: Tax return. Communication and tax advice excellent. Only minus point the error in the taxable income which I have discovered after reviewing the forms and relevant documents. Hi Spyridon, many thanks for your comment. We will work to get those 5 stars from you in the future. I am a British/American ex-pat living in Hamburg. After a couple of failed attempts at filing tax returns in 2015 and 2016 which could have resulted in a lot of delay penalties I was referred to Martin Gundermann at Intertax. I was immediately impressed by the level of concern and personal interest Martin showed in my situation, and how Martin chose to prioritize my needs to suit the circumstances. Martin worked quickly and efficiently. His communication and manner was excellent and he made the whole process easy. Today I am current with my taxes and avoided every penalty. This would not have happened without Martin's expert and professional help. I cannot recommend Intertax and Martin highly enough. Very Friendly. Always reply quick. Highly recommended. Personal contact, always available online. Experts on expat tax issues, particularly, dealing with Spain / Germany taxes. Very reliable services. Always helpful and willing to solve any issues. Giving useful advices and answering even the most dummy questions. Very good service. Excellent communication. Even though 2014 submission was late, and offer was given to cover part of the incurred charges. Very satisfied. Thank you. I've been using Intertax since it's formation and previously worked with Martin Gundermann at his previous affiliation. As an American citizen resident in Germany involved in managing businesses in Africa and the United State, I have an especially complicated tax circumstance. Martin and his team have been nothing but competent and professional in their work. I highly recommend his services. Mr. Martin Gundermann provided an outstanding service in my income tax preparations for the past two years. He was always very prompt and clear in his responses to all of my questions. He made my tax return a hassle free experience. I highly recommend his service. All the correspondence was very easy and clear and all the team was very efficient and friendly. I liked that Herr Gundermann took the time of answering all my questions very quickly and was very clear in his explanations. Ours is a very complicated return, rental income foreign income etc.. They are very responsive to my questions and allows me to review the return before submitting it. Promt responses, comprehensive emails. A very good service! ► I award 5 stars | ► Valuation in relation to: Tax advice. Martin Gundermann's English is excellent. I was able to speak with him as I would do my UK accountant. He speaks like a Brit, so, in my opinion, I'd recommend any English speaking person to speak with Martin if they need tax advice as you will not feel like there is any language barrier, he is very helpful and knowledgeable about German tax matters for UK Ltds. He made me feel like he wanted my business. ► I award 5 stars | ► Valuation in relation to: Refund German Pension Fund. Intertax-consult helped me with my taxes when I lived in Germany, and helped me recover my pension fund contributions two years after I returned to the US. In both cases, they were very professional and efficient. I would highly recommend them to any other American dealing with the German tax system. It's a pleasure to work with such a consumate professsional! I'm more than happy to recommend you and very pleased with your services. ● Certificate of authenticity granted. The client confirms to the editorial of regionalwissen.de via a phone call his information. ● The full name of the evaluating person is known to the editorial. ► I award 5 stars | ► Valuation in relation to: german tax advice. It has been a real pleasure to work with intertax. All work was done in a very smooth process and we are more than happy to have found Martin and his team. It was a pleasant experience consulting Martin in tax matters. Your diligence and willingness to help is very much appreciated. Your advice and guidance has helped me a great deal! ● 5 Sterne hat der Kunde dem Unternehmen gegeben.